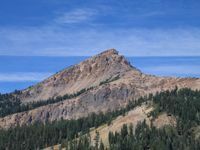 For sheer beauty and rugged mountain scenery the Brokeoff trail is one of the best in Lassen Park. The trail climbs steadily through open meadows and forest for two miles and then through scattered hemlocks and finally above timberline to the top. At the west end of the mountain just before the last half mile of the climb, there is a good view of Mt. Shasta. From the top of the mountain there are good views of Lassen Peak, Conard, Chaos Crags, Diller, Shasta, and other mountains of the vicinity. The view of the old Brokeoff Volcano (Mt. Tehama) caldera is excellent from the summit. The trail is considered one of the toughest in the park, though also one of the most rewarding. Hiking boots are recommended as the trail traverses a variety of terrain from volcanic sand to rocky outcrops. The one-half mile elevation gain and distance of the trail require a great deal of physical exertion to overcome, but the views at the top can’t be matched.